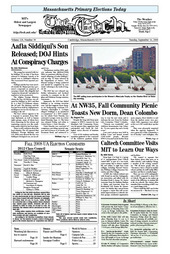 The MIT sailing team participates in the Women’s Man-Labs Trophy on the Charles River on Saturday morning. The young boy arrested with Aafia Siddiqui ’95 on July 17 has been released to Pakistani custody to be turned over to Siddiqui’s relatives, The Associated Press reported yesterday. Despite the long trek from main campus to NW35, turnout for last Monday’s fall Community Picnic was far greater than organizers had anticipated, said Gayle M. Gallagher, senior director of Institute events. From Sept. 2 to Sept. 4., a group of 11 undergraduates from Caltech visited MIT as part of a two-week, cross-country trip to observe student life and culture at eight East Coast colleges, including Harvard University, Williams College, Princeton University, and Olin College. Harvard University’s $36.9 billion endowment earned 8.6 percent on its investments in its latest fiscal year, the school’s money managers reported Friday, even as stock markets around the world were losing money.